As with any crisis, the question of how much is spent by whom comes to the forefront. It is usually the case that the answers are not immediately apparent. Enter Amanda Glassman of the Center for Global Development. She pulled together what information she could find on how the world is responding to the Ebola crisis in West Africa. The lack of aid accountability in the aftermath of a crisis is an ongoing problem for the development community. The amount of aid given in the aftermath of Haiti’s 2010 earthquake is still difficult to quantify, and tracing US government funding down to the subcontractor remains next to impossible. A public health emergency such as the Ebola outbreak in West Africa faces largely similar risks when inflows of money are difficult to trace. Aid may be allocated inefficiently; contractors and subcontractors will not be held accountable for outcomes. Governments that already face the pressures of managing a developing economy often lack the infrastructure to manage these large inflows of cash. The onus for accountability therefore ought to be on the donors, not the recipient country governments that are in the midst of coping with an evolving emergency. Releasing comprehensive, regular updates to the OCHA database would be a good first step, and should be considered a priority for all donors—if only to be sure that your press releases are accurate. 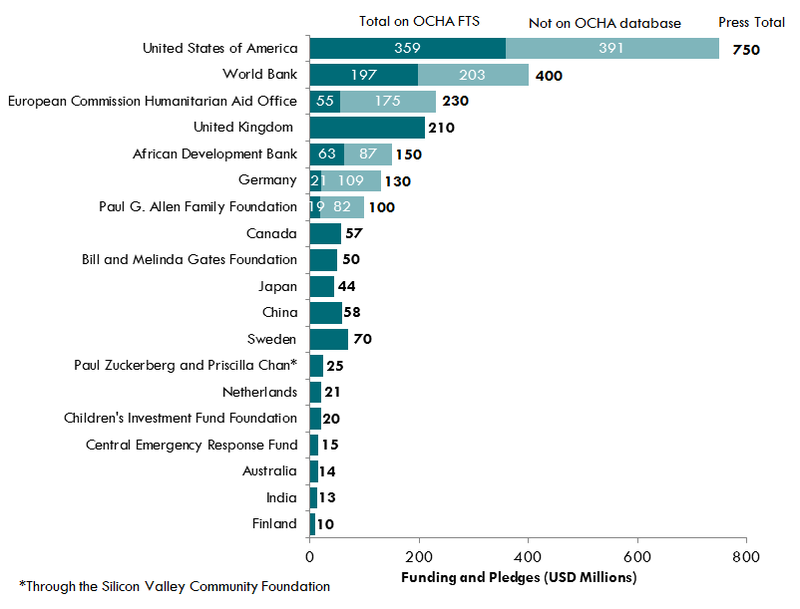 But the UN OCHA database also needs to provide more detail about the allocation and use of funding to be most useful. Smarter allocation and greater accountability and evaluation are only possible if exact uses, locations, and recipients are known. See her full post and analysis here.